A humble cart, but a damn good one. It’s hard to imagine that I need to tell anybody about wonderful Daisy May’s BBQ. There aren’t many BBQ joints in NYC, and even fewer of them are any good, so Daisy May’s is a standout. To this date I’ve yet to visit their mothership storefront on the far West side of Midtown, but I’ve been going to their cart for years. 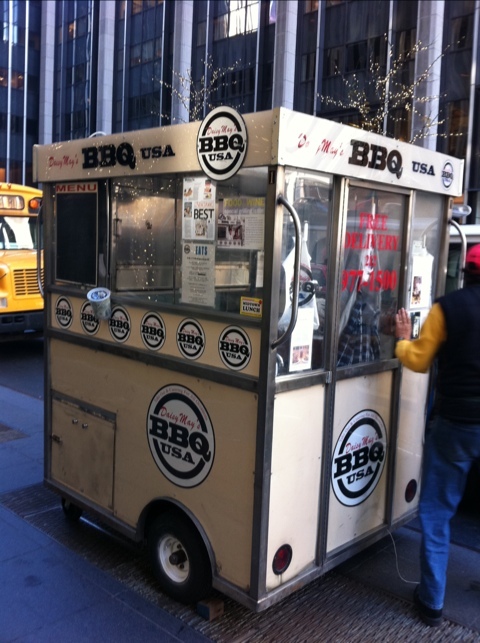 Indeed, their cart preceded to current food cart craze gripping the city (and me). A very tasty menu indeed. 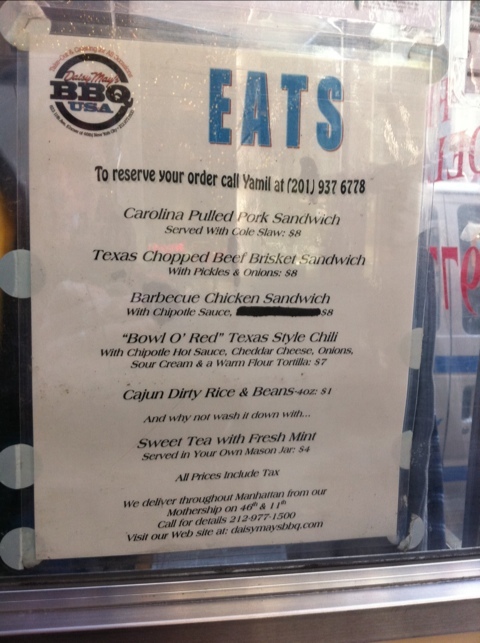 I’m always partial to their brisket offerings (chili or a sandwich), this time opting for the sandwich. The biggest difficulty is that it’s build-it-yourself. They send you from the cart with a bun, a plastic container of warm beef, some onions and pickles. Some assembly required. Unless you eat a bit of the beef before attempting to stack it all onto the sesame seed roll, your roll with runneth over. As it did for me. First, though, I stirred in the onions. The assembled sandwich. Beefy goodness. 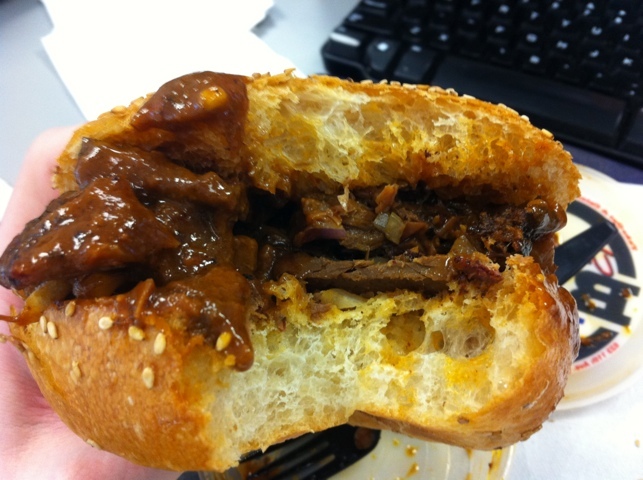 The sandwich was more than a little sloppy, with large chunks of brisket occassionally glopping out the side of the bun and onto my hand. 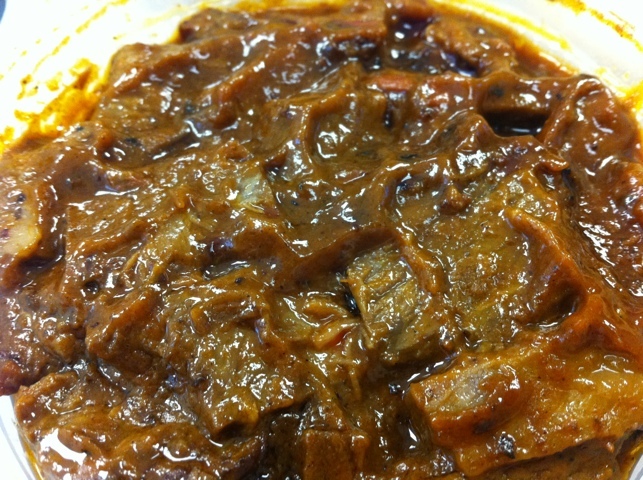 The beef itself has typical bbq traits: it is smoky, with a strong sweet to it. Overall the flavor evokes a meat candy. 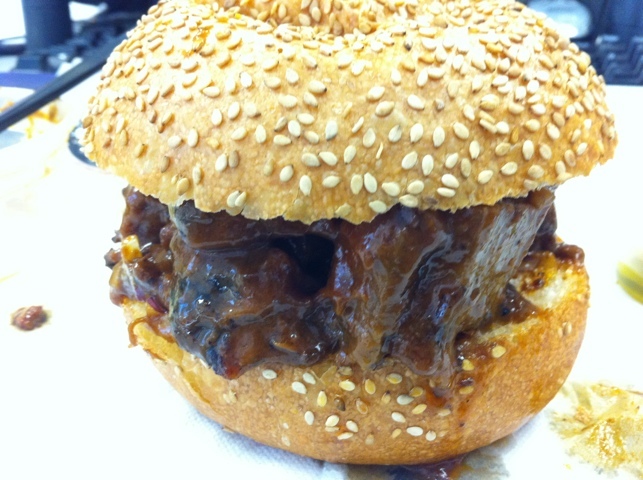 The brisket chunks are large, neither fatty nor tough, and there’s a reasonable black bean note in the sauce. The pickles are also pleasant, with a touch more of a vinegar note. I’ve yet to find a major BBQ player in town, but for now Daisy May’s is pretty much tops in my book.